Pandae Storage offers a complete range of systems and products with quality and service being the backbone to the entire offering. Founded in 1968, METALSISTEM commenced its activities specialising in the design and production of machinery for the cold profiling of metals. Today METALSISTEM Group is an articulated network of companies with its head office and main production facility in Rovereto, Italy. 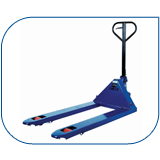 The Group has consolidated its position as one of the major industries within the Material Handling Sector. The company SIO 9001 quality assurance system as well as its environmental management system ISO 14001 are certified by RINA. The METALSISTEM Group affiliated companies and distributors provide a world wide commercial network covering the Italian market and the industrialised nations of the world, able to satisfy the most demanding needs. We value greatly the high level of trust that is placed in us by our customers and feel that it is proof of the quality and reliability of our products. 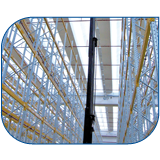 For this reason Pandae Storage boats the full range of Shelving, Racking and Mezzanine Flooring systems from METALSISTEM. Optimizing time and space is the key to efficient store management. 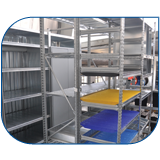 Pandae Storage Systems provides complete, flexible single or multi-tier modular shelving systems of the highest quality for diverse applications. Veniam, quis nostrud exercitation ullamco laboris nisi ut aliquip ex ea commodo consequat. Duis aute irure dolor in reprehenderit in voluptate velit esse cillum dolore eu fugiat nulla pariatur. 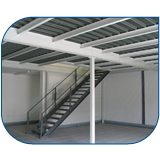 Multi-tier installations can be created using both steel platforms and raised storage areas which result in additional storage levels which are the same size as the ground floor installations. 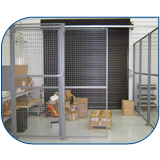 Pandae modular safety fencing is designed and manufactured to match the area needed to be fenced, whether for safety reason or to control the access of people. The Pandae range of Cabinets have been specially designed with our years of industrial experience. 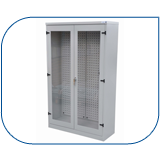 These strong and robust cabinets come in various colours and are powder coated in a durable epoxy finish. Pandae Storage Cabinets take up less than 0,650m2 and can store up to 500 line items per unit. 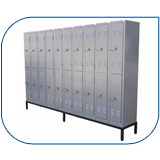 All compact storage cabinets are stand alone units, thereby alleviating assembly costs and enabling ease of re-arrangement at a later stage. 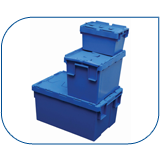 Pandae have developed a range of bins suitable for small to medium sized parts to be stored in. Whether it is on shelving, racking or louvre panel stands our bins and dividers will assist in reducing product contamination. Our salesteam is standing by to assist you with any questions you may have.